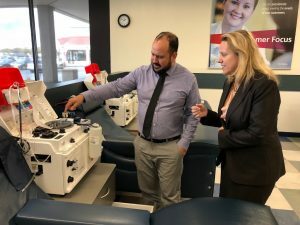 State Representative Deanne Mazzochi (R-Elmhurst) tapped into her biochemistry expertise on Friday as she toured the CSI Behring Plasma Donation Center in Melrose Park and learned about how this local business works with local residents to become the life force of a multi-step bio-therapeutic process that saves lives. Patients who suffer from rare critical diseases depend heavily on donor plasma to stay alive. Plasma collected at the CSI center is transported to a larger facility in downstate Kankakee, where it is transformed into life-saving treatments for individuals living with blood coagulation disorders like hemophilia, immune deficiencies and many other diseases and disorders. 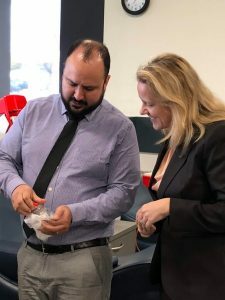 The products are also used during cardiac surgeries, organ transplantation and other major surgeries; the company has developed a new innovative treatment product that is heading into FDA clinical trials. 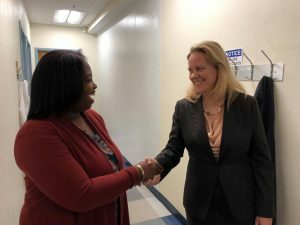 In addition to Castillo, Mazzochi spoke with John Conrad, President and CEO of the Illinois Biotechnology Innovation Organization, Roy Pura from CSI Behring Government Affairs, and others about the center’s successes and challenges. “The need for plasma is growing, so this is an area where we should really be helping current businesses grow and expand here rather than moving operations to other states.” Mazzochi said. CSL Plasma, headquartered in Boca Raton, FL, is a division of CSL Behring, a plasma protein biotherapies company headquartered in King of Prussia, Pennsylvania. The Melrose Park collection center is one of eight CSL Plasma Centers in Illinois.